He opened his eyes. A scarlet steam engine was waiting next to a platform packed with people. A sign overhead said Hogwarts’ Express, eleven o’clock. Harry looked behind him and saw a wrought-iron archway where the barrier had been, with the words Platform Nine and Three-Quarters on it, He had done it. Smoke from the engine drifted over the heads of the chattering crowd, while cats of every colour wound here and there between their legs. Owls hooted to one another in a disgruntled sort of way over the babble and the scraping of heavy trunks. Today we are adventuring into the world of Harry Potter and the Hogwarts Express. When Pottermore the Harry Potter online database opened in 2012 we were able to learn more about the history of the locomotive and a few rather interesting facts came to light. “The Hogwarts Express was originally built by the Muggle engineers at Crewe, in Cheshire, England, as a Hall Class steam locomotive, in the early-to-mid 19th century” (Pottermore, 2012). The locomotive is now said to be converted to run purely on magic rather than steam. Pottermore goes into get length about the history of the train itself. Sometime in 1827, Ottaline Gambol rose to the office of Minister for Magic, and she made a daring and controversial suggestion to solve the ages-old problem of how to transport hundreds of students to and from Hogwarts Castle every school year without attracting the Muggles’ attention: intrigued by the Muggle technology, the Minister saw the potential of using a train as a secure and comfortable alternative to Portkeys or to unregulated means of travel. The Ministry of Magic conducted a a large-scale operation involving one hundred and sixty-seven Memory Charms, as well as the biggest Concealment Charm ever performed in Britain, in order to acquire the locomotive. The morning after this operation, the residents of Hogsmeade awoke to find the gleaming red Hogwarts Express and a railway station that had not been there previously, and the Muggle railway employees in Crewe had the feeling they had misplaced something, which stayed with them for the rest of the year. There was initial resistance from pure-blood families against using a Muggle-built device for wizard transportation (which, they claimed, was “unsafe, insanitary and demeaning”), until the Ministry decreed that students would arrive to school on the train or not attend at all. Anyway its time we actually look at the locomotive that starred in the Harry Potter film series ex GWR 5972 Olton Hall or how it will forever be known in the hearts of Harry Potter fans Hogwarts Castle or the Hogwarts Express. 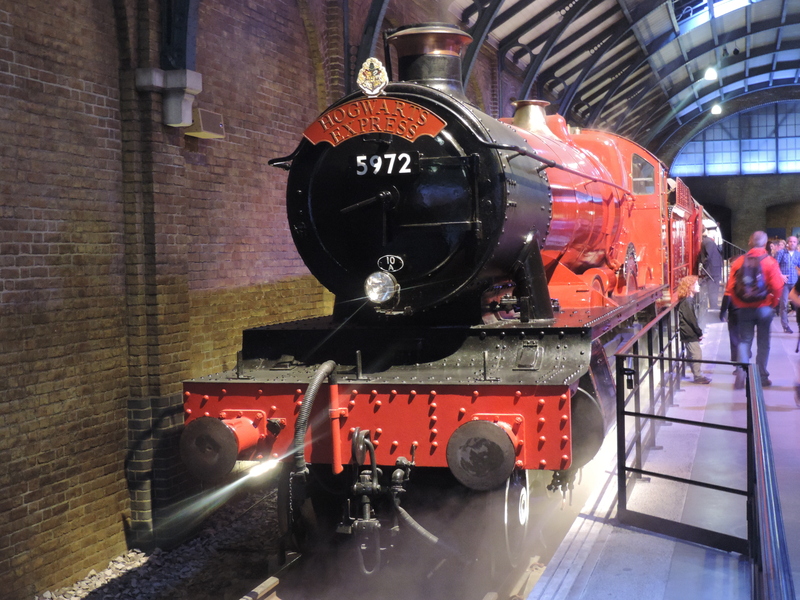 I wrote a piece last year about the news that Harry Potter World in Watford will be unveiling a 20,000ft² expansion, including the original Hogwarts Express steam engine and a recreation of Platform 9 ¾ and this new extension opened earlier this year. The views that I made were controversial and caused some debate on various social media platforms. Many enthusiasts are upset about the possible fate of this locomotive and you can understand why – it was not something envisioned by those who saved it from the scrapyard after all. However I am an enthusiast who returned to the hobby after purchasing the Harry Potter and the Philosopher’s Stone train set which starred Hogwarts Express. I believe that there are certain locomotives such as Hogwarts Castle/Olton Hall, Mallard and Flying Scotsman that are so famous they inspire and stir the enthusiasm of the younger generations when they see them. I would rather see her placed in this museum where she can seen, photographed and loved by her fans (most of who aren’t steam enthusiasts) than living in Carnforth where no one can see her, making the occasional mainline trip or the National Railway museum which already has the likes of Flying Scotsman and Mallard. Railway preservation is entering an unknown future where the ranks of the volunteers are starting to thin out and need replacing with young blood. If this one locomotive can help inspire people to get involved on the railways, then it has done its job for the greater railway good. After my experiences at the studio and seeing the general publics reaction to the locomotive it seems I have been proved half right as the locomotive was being loved, photographed and wowing the Harry Potter fans on the tour. Wither this turns and inspires people to get involved in the railway heritage scene is another matter and only time will tell but in the mean time she is flying the flag for the British heritage scene. I spent about 20 minutes trying to get a decent shot of the locomotive without any crowds or people in the shot but it was near impossible and goes to show the popularity of the locomotive. I did get a few chuckles listening to some of the converisons of my fellow visitors who were talking about the locomotive. Some were wondering if it was a real steam locomotive or an electric one like at the Harry Potter theme park in the States and one gentleman was certain that it was the Flying Scotsman painted red. I do hope Hogwarts Castle or Olton Hall depending how you view her stays at the Studio tours and inspires people about our railway heritage. I would love to hear your views about the 5972 so feel free to comment below.